Like in the play 'Fiddler on the Roof,' tradition has always played a part in Aaron Plaisted's volleyball career. 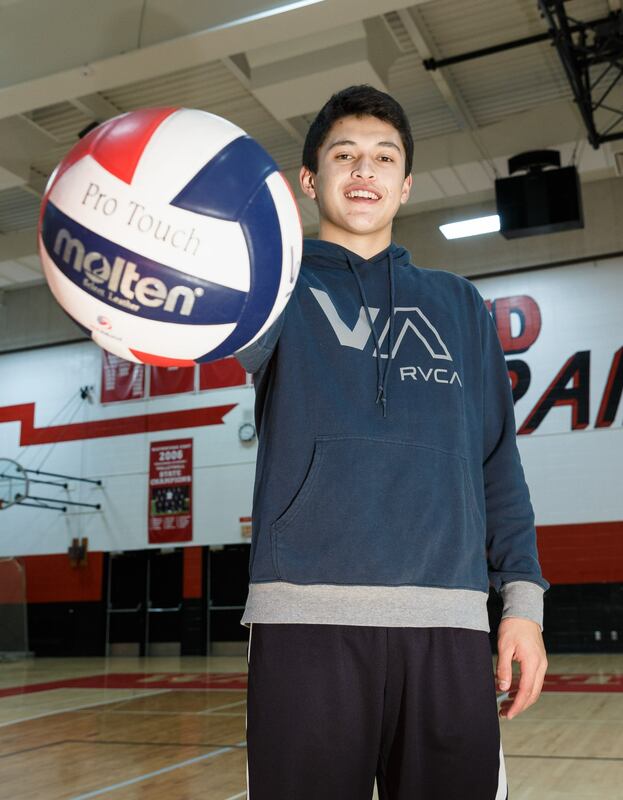 Plaisted, a four-year varsity starter for Wauwatosa East, began playing when he was 10 years old for the North Shore Volleyball Club, which is now the Milwaukee Volleyball Club (MVC). 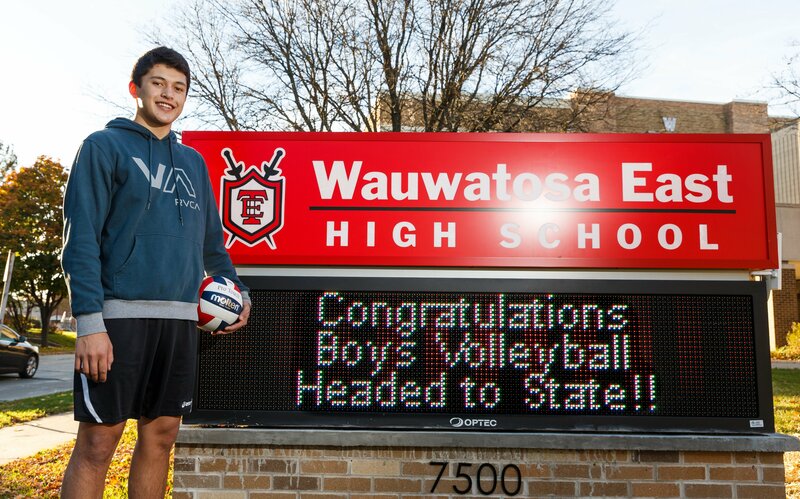 This week he followed in his brother Ben's footsteps and was named boys volleyball State Player of the Year by the Wisconsin Boys Volleyball Coaches Association. His father, Jim, and Tosa East boys volleyball coach John Simon founded the club in 1990, and Jim is an assistant coach for the B17 team. Jim also was an assistant coach at Wauwatosa East High School in 2007 and 2011-2013; 2015. An outstanding volleyball high school player, Jim played three years at Whitefish Bay and was the Most Valuable Player of Suburban Conference in 1980 when his team won the title. Aaron's older brother, Ben, also played for the Red Raiders and was the Wisconsin Player of the Year his senior season (2014). He holds several records at Tosa East and is currently a junior on the Loyola University Chicago volleyball team, which won the national championship in 2015. "Part of it was the family tradition," Aaron said when asked about why he got into volleyball. "It's just been a thing in the family. It's a lot of fun and I get a lot of knowledge for the game and I like playing it." Growing up and then playing on the team with his big brother was also a benefit. "It's nice having a player like him to look up to, especially when I was younger," he said. "He was always ahead of me at the game and he is playing at a high level right now. It's good to look up to him as a player. It is also a good drive for me to try and be better than him." Ben was also ready to help out Aaron and his teammates and that is something that Aaron has carried on. "He was a big help when I was a freshman and he was a senior and we both played on varsity. He was a big help to our team and to me. He gave me a lot of pointers. He helped me out, keeping my head up." Simon pointed out he knew he had something special in Aaron. "I typically don't keep freshman on varsity," he said. "But as a freshman, he came in and was clearly one of the better players. I had him at libero his freshman year. He was a good ballhandler, he could pass, he could play defense and he wasn't really tall enough to handle the load to be an outside hitter in high school. "In 30 years of coaching, he was the second freshman to make the varisty (Andy Patton was the other in 2002)." Aaron now plays left outside hitter for the Red Raiders, but he is Simon's most versatile player. "He is so multi-faceted," the veteran coach said. "He was a libero as a freshman. He can play right side, left side, I had him setting. His skill set is as completely developed in all facets of the game. "It makes it easy for me. I'll tell him 'I'll plug you in here. I will plug you in there.' I can find a spot, the best spot for him. Last year he played the right side. This year we wanted to get him the ball more, so we played him on the left side. I had to have him in a place where he was receiving a serve." "I think I have a higher volleyball IQ than most players," Aaron said. "I think that comes from a lot of years of experience since I'm been playing since I was 10 and most kids get into volleyball when they're in high school. I do think I have a good arm swing and I swing pretty hard." But Aaron knows his game isn't perfect. "In volleyball there is always stuff to work on, it's a game of errors, pretty much," he said. "I maybe have to work on my shot selection with hitting. I can hit better shots, keeping discipline." Simon agrees with his star player. "He hits the ball really, really hard in a certain spot. Now he defaults to one spot in his wheelhouse," he said. "If a blocker knows that, gets in the right place, they can block that. "So he has to work on not only hitting that power shot, but he has to hit that crosscourt shot. He has to be able to hit the line shot. He has to be able to hit them all." Aaron is a team captain for the second year in a row. He talked about being a leader on the team this year. "I really try and be a vocal leader and I talk a lot on the court," he said. "I encourage people to talk a lot with me. That's a big part of volleyball. If you're not talking on the court (there is a problem). "With all the younger guys we have, with all the knowledge I have, I try to spread it around as much as possible. I always try to pick kids up when they're down. I try to encourage my teammates to do the same. Like I said, mentality is a big part of volleyball." Simon pointed out that Aaron was a captain as a junior, which doesn't happen too often, along with a senior teammate. "He defaulted to the senior last year, but this year he took on a more proactive role in helping other kids come along," Simon said. "He's played on a very high level club team. When you leave the club scene with the best players around and you come to your high school team, those kids aren't as invested as you are. You have to bring them around. "I said, 'Aaron they're excited to play with you because you're the best player around.' He kind of bought into that. I could see him help the kids on the high school team with their technique." Simon then paid Aaron one of the highest compliments I have ever heard a coach give. "He has a higher volleyball IQ than more than 90 percent of all the volleyball people, including some coaches." It is not surprising that a talent like Aaron had high expectations for the season. "My goal is to play at the highest level possible at all times," he said. Along with coach Simon doing a great job of coaching us, I try to coach myself personally all the time; trying to figure out things I can get better at. Small things - as little as keeping my elbow up when I swing. "As for the team, we set our expectations high. Now that we're getting into the playoffs, we set our goals one at a time and focus on the game ahead of us." The Red Raiders played in the WIAA State Tournament last weekend at Wisconsin Lutheran College. They beat Arrowhead, 3-1, but lost to Marquette, 3-0, in the semifinals. Aaron finished with 27 kills in the two games and 12 digs. It was the 10th time in the school's history the Red Raiders went to state, having made it in 2014, Aaron's sophomore year. "The atmosphere at state was probably one of the most unbelievable thing I've ever seen," he said looking back at his sophomore year. "We had like 3/4 of our school there. It was awesome. Right as I walked out of the locker room, I didn't expect to see that many people there. When I did, I got some huge chills." Aaron then tipped his cap to the Red Raiders' supporters. "We have crazy fans," he said. "The guys who are getting rowdy (in a good way) in the stands are normally my best friends. It's awesome to have them talking. I can always hear them in my ear." This season Aaron was the Player of the Year in the Greater Metro Conference and a first-team all-conference choice the second straight season. He was honorable mention in his freshman and sophomore seasons. He was also All-State honorable mention as a junior and Volleyball Magazine's Top 25 players to watch as a junior. He was also invited to USA volleyball A1 training and made the all-tournament team in 2014 (top 40 players in the country). Looking back at his career, Aaron summed it up simply.
" It went really fast, I thought, and it's been a lot of fun; very exciting." Simon saw it a little differently. "It a roller coaster ride. His freshman year he's libero. His brother is State Player of the year and Brookfield East breaks our heart in the sectional final. "His sophomore year we're under .500 and we the break Brookfield East's heart in the sectional final and go to state. Last year in the sectional final vs Brookfield East - thinking we have a good chance (to go to state) and they beat us. So it's been up and down, up and down. Thankfully it was another 'up'. "He is so talented. He had a great run here." FAVORITE MUSIC/GROUP: Chance the Rapper, Kendrick Lomar. FAVORITE TV SHOW: Californication comedy series. FAVORITE SPORTS RIVALRY/ATHLETE: Wauwatosa West, Brookfield East, Marquette. MOST MEMORABLE SPORTS MOMENT: Beating Brookfield East sophomore year to go to state; pitching a shutout against Sussex Hamilton.